Ballinvounig House Bed & Breakfast | B&B Accommodation, Dingle Peninsula, Kerry, Ireland. Welcome to Ballinvounig House This beautiful Countryhouse enjoys a fantastic location, just 1.5km from the pretty tourist town of Dingle on the Tralee Road (N86). Here at Ballyinvounig House you can relax in the peace and quite of the countryside, yet the lively hub of activity that is Dingle is just 1.5km away. 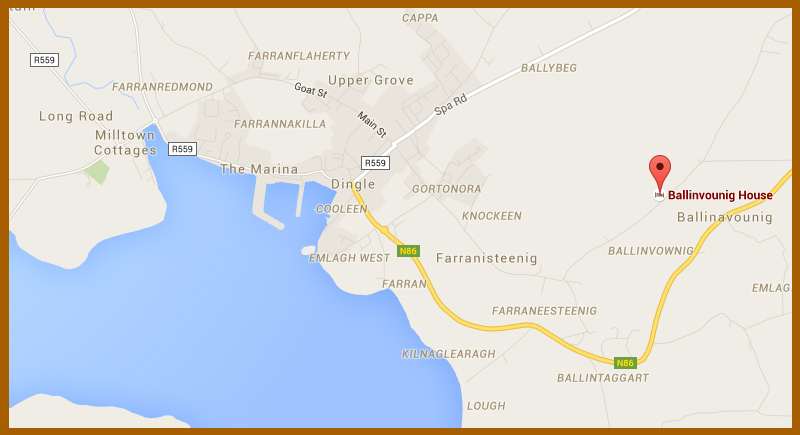 In Dingle you can sample a mixture of crystal blue waters, beautiful restaurants and outdoor activities. Ballinvounig House consists of four comfortable ensuite bedrooms. Each bedroom has been tastefully decorated throughout to ensure your comfort during your stay. Guest amenities in each room include tea & coffee making facilities, a TV and a hairdryer. Affordable and Comfortable ensuite room available. There is also a large garden for guests use. Private parking is also available at the property. A warm welcome on arrival and a home from home atmosphere can be enjoyed here. Guests can enjoy the peaceful views of the countryside. Ballinvounig House is located a mere 1.5Km from Dingle Town in a quite country setting. Perfect for walkers & people on the Dingle Way. Discover Ireland - Visit the South West, Holiday on The Dingle Peninsula in Ireland. The Atlantic sea washes against the rugged landscape of the Dingle Peninsula and the constant weather changing climate present the visitor with unexpected, stunning photographic excitement. The sightseeing visitor will be amazed at such an abundance of natural beauty. Among the visiting Attractions are: boat trips to the Great Blasket Island & Eco Tours, Dolphin boat trips, the Ocean World Aquarium & a Seal Sanctuary. Of great Cultural Interest are the famous Harry Clark's Stained Glass Windows. Many locally acclaimed Artists capturing the image on canvas and the talented Crafts people making truly unique pieces in all kinds of materials. There are weekly Summer Concerts in St. James Church and the Dingle Beehive Theatre Company provide the entertainment. Of course not forgetting our famous Pubs & Gigs, local musicians playing Traditional music for the "thirsty" and fun loving kind. The surrounding hills and fields are dotted with grazing sheep and cattle and the Atlantic spray gives our beef and lamb that unique delicious flavour. It is rated among the best in the world. It is also a perfect arena for the sporty, active holiday maker. On offer is: Walking & Trekking, Horse Riding, Surfing, Sailing & Canoeing, Fishing & Angling, Cycling, Golfing and Pitch & Putt. The many safe beaches in the area is a child's paradise for roaming. A visit to The Dingle Peninsula is unforgettable, even if you are the traveller that yearn peace and quiet. Come and check it out.